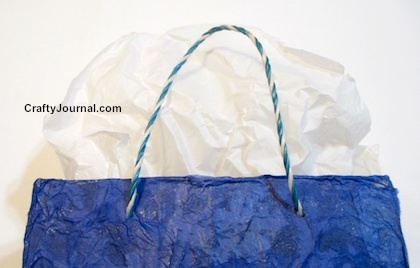 Here’s how to go from a cereal box to a gift bag with just a few craft items. And the gift bag is so sturdy you can use it again and again. You can also recycle used, torn, or crumpled tissue paper to cover the box because it won’t matter if the paper is wrinkled. 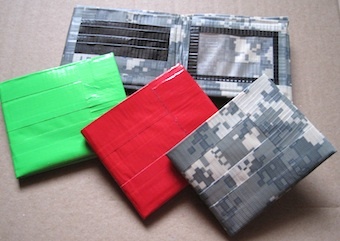 A colorful way to cover a box would be to use different colors of tissue paper. 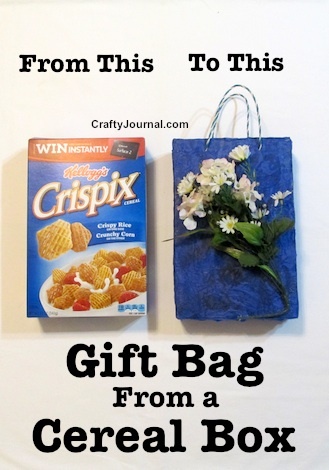 How to Go From a Cereal Box to a Gift Bag. 1. Cut all the top flaps off the cereal box. 2. Scrunch 2 sheets of tissue paper into a ball and open up again. 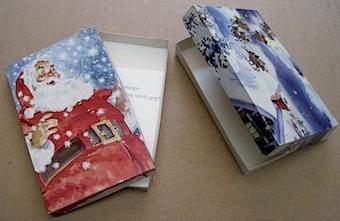 Cover the front of the box with a thin layer of white glue. Leaving an inch or two of tissue above the top of the box, lay the wrinkled paper on the box, and gently press down all over. Turn the box to one side and repeat the process. 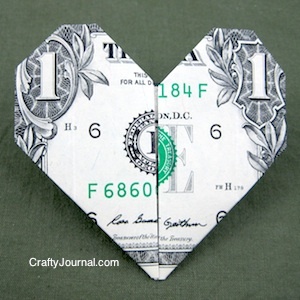 Cut off the excess paper to use for the second layer. 3. Add a think layer of glue over the first tissue layer, being careful not to tear it, as the tissue paper is very fragile when damp. 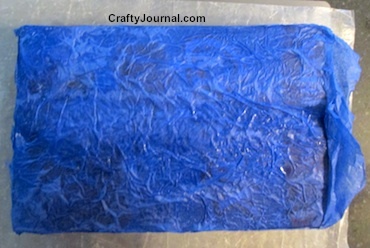 Lay a second piece of tissue paper over the first layer and press down gently. If you tear the tissue paper, you can gently push the edges back together. 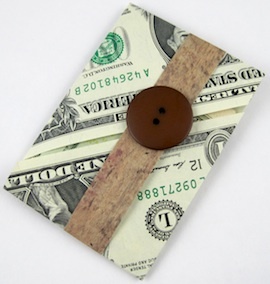 Or raggedly tear a small piece of tissue and glue over the spot. The ragged edges won’t show like a straight edge would. Repeat this process with the back of the box and other side, until you have covered the whole box. You can use a hair dryer to help dry the tissue paper. 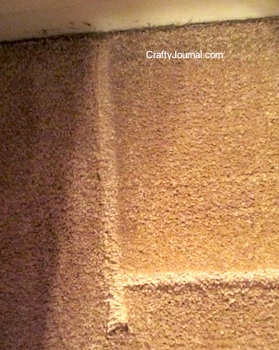 I found that the sides dried slowly, and I let them dry overnight before I finished the box. 4. When the box is dry enough to handle, cut a slit straight down from the top of the tissue paper to the top of the box at each corner. This will allow you to fold the inch or so of tissue paper down into the box and make a nice finished edge around the inside top. 5. Put a thin layer of white glue just inside the top of the box. 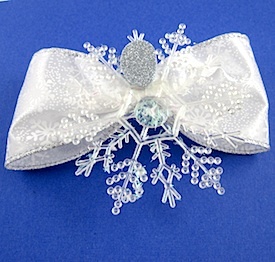 Fold the tissue paper down over the glue and gently press to adhere. Do this all the way around the top of the box. Let the box dry overnight. 1. Punch holes to insert the handles, leaving about 3 1/2 inches between the holes. Find the center of the bag at the top. Mark each hole 1 3/4 inches to each side of center, about 3/4 inch down from the top. 2. Cut 2 handles about 20 inches long. Put one end of the handle through the hole and tie a knot large enough so that it can’t slip back through. Put the other end of the handle through the other hole and tie a knot. The part of the handle above the bag should be about 12 inches. 3. Repeat with the other handle. or the outside of the bag, according to how you prefer it. 4.Use a pretty spray of silk flowers that is a little smaller than the bag. 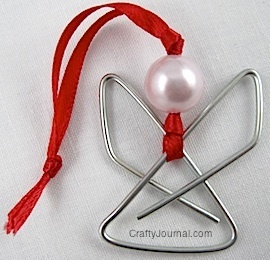 Wrap thin wire around the center of the spray and tie in a knot on the back. Lay the flowers on the front of the box to see how it looks best. After you’ve decided the best location, punch 2 small holes (I use an ice pick) about 1/4 of an inch apart where the center of the flowers will be. Put the ends of the small wire tied around the middle of the flower spray, through the 2 holes, and tie them on the inside of the bag. I think the flowers make a wonderfully dramatic decoration for a gift bag. Any kind of thin rope, twine, or ribbon can be used for handles. Grommets could be added to the handle holes before the handles are put on. I used plastic clothesline for the handles on this bag. The plastic clothesline had a mind of its own! To straighten the handles, I heated them with a blow dryer and hung the bag (with a bit of weight in it) for a few hours. Thanks for such a cute, easy idea. I recycle cereal boxes for a variety of items but had not thought of making them into gift bags. Very clever!